Lake Chatuge, constructed by the Tennessee Valley Authority (TVA) in the 1940’s for the purpose of flood control and utility power has transformed Towns County into a hidden paradise for fun and recreation. Lake Chatuge is one of the largest open bodies of water in the Blue Ridge Mountains, with 128-miles of shoreline and an additional 4-miles of island shoreline. 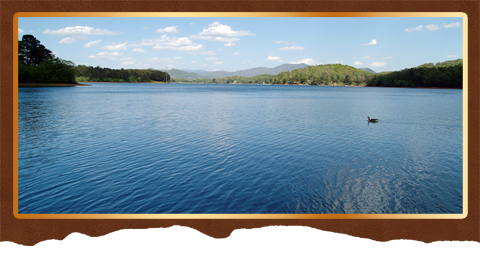 Lake Chatuge is regarded as one of the most beautiful man-made lakes in the Blue Ridge Smoky Mountain Province. This picturesque lake is surrounded in all four direction of the compass by towering majestic mountain peaks, some reaching heights of over 5,000-feet above sea level. Lake Chatuge is divided at its center by the state lines of Towns County, Georgia and Clay County, North Carolina. Along the eastern shoreline of Lake Chatuge is the resort town of Hiawassee, accommodating all the needs for its local residents as well as vacationing guests. Though the lake does operate under the management of TVA as a utility lake and flood control, the majority of the shoreline is privately owned and laced with picturesque summer homes and full time residences. Outside its natural beauty the lake’s most popular attraction is water recreation offering fishing, boating, skiing and jet skiing, sailing, swimming and sunning along its sandy beaches. Camping in designated areas along the lake’s wooded shoreline is available along with excellent local lodging. There are several quiet wilderness trails along its shores, as well as one trail that’s very popular with mountain bikers. There’s also a fairground filled with events and festivals providing a pleasurable accent to the visible beauty that Lake Chatuge has to offer. Where Chatuge Lake rests today was once a magnificent hidden valley dotted with homes, churches and family farms often along or near the banks of the Hiwassee River. Lake Chatuge consists of 3,500-acres in Towns County Georgia and 3,700-acres in Clay County North Carolina. During the lake’s early construction it was necessary for homes, schools, churches and grave sites to be moved out of harms way or left to the destruction of river’s water and tributaries flowing down from the high mountains surrounding the lake. The upheaval of families was difficult for some of Towns County’s early residence and an opportunity for others looking for a fresh new start beyond the horizon. Today Lake Chatuge is a destination unto itself, drawing visitors annually to its shorelines and open waters. By far Lake Chatuge is a wonder in its making and a magnificent sight to behold and enjoyed by folks of all ages. This Highlander Mobi was created to guide those looking for points of interest such as campsites, picnic areas and boat launches on Chatuge Lake. Fishing along the lake’s shoreline where public access is available is located at Jackrabbit Mountain Recreation Area, along with other designated lake campgrounds and along the river banks below the dam on TVA controlled property.